So I have officially caught the pumpkin bug! I could bake year round with pumpkin if it was seasonally acceptable (which I’m sure no one would balk at that) but I know a few people who would give the weird side eye if I whipped out a nice big pumpkin pie during our 4th of July get together. And yes, that is something I would totally do. Why you ask, well because I can! Now another bug has been caught in my house, and unfortunately this one is of the bad variety. My kids are getting sick again. Boo. You know when school starts around this house because people become ill within the first 2 weeks. I’m starting to miss summer break already. No sicky germs to really worry about, and I usually catch everything my kids get so I’m not looking forward to any of it. Especially since I do daycare for a little baby! Let’s hope and pray that this passes quickly and maybe just maybe our bodies are just fooling us and its the weather change causing the coughs and sniffles. A girl can only hope! You guys know my love of wandering the Walmart aisles just perusing my heart away. Well look what I found myself a little while back. Yup, salted caramel frosting! This stuff was awesome. And in light of Culver’s coming out with their Salted Caramel Concrete Mixer I figured I’d give it a go at topping this perfect roll with this its amazing counterpart! Have you seen that little trick that’s been around for a while now where you heat up your frosting and pour it and it becomes a glaze? Whelp my friends, that’s what this old gal did to this! Turned out great if you ask me. So much easier to frost! So anyways, on to this pumpkin roll. I’m a cake roll fan. I love being able to have multiple layers of frosting but not have to worry about making a layer cake. And you can pretty much create any flavor combinations that you could think of. Red velvet and carrot are high on my list of favorites! Sadly I haven’t made carrot cake dessert yet this year! I don’t know what is wrong with me, my 7-year-old absolutely loves carrot cake too! So this may still happen, like I said I’m very untraditional and random weird things will pop up in my kitchen at the most random times. But I’m so happy that it’s finally fall so I can make pumpkin everything! Is it too early for gingerbread? Pre-heat oven to 375. Line a 15x10" jelly roll pan with parchment paper. In bowl mix together all your ingredients and pour into prepared pan. Bake for 10-15 minutes or until golden. Remove from oven. Sprinkle a smaller towel with powdered sugar and turn cake out on to that. Slowly roll up the cake in the towel starting on the shorter end. Leave rolled until cool. Meanwhile in bowl combine all filling ingredients and mix until smooth. Once cool unroll the cake and spread the on the filling. Roll back up. In microwave melt your frosting until it becomes liquidy, about 30-45 seconds. Pour frosting over top of cake roll then sprinkle with sea salt. This looks amazing! I love the salted caramel glaze. 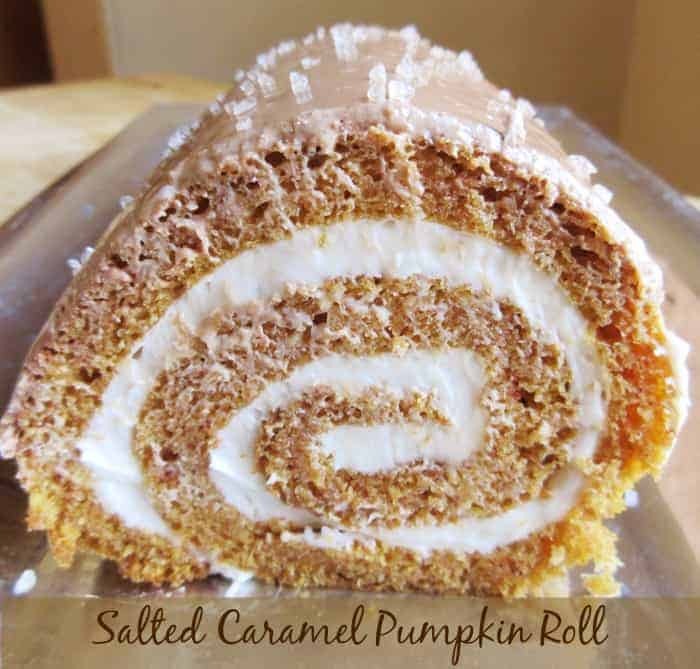 Now I really want to do a pumpkin roll cake this fall too. Unfortunately my list of things I want to make and the time I have to make them don’t always match! Haha right. Prioritize. I most of the time end up with more food than I can consume. Luckily I have willing parents who love taking it off my hands. Thanks Kathryn!! Yes pumpkin could be my go to flavor 24/7. I literally sit in wait all year long for DQ to announce they have brought back the Pumpkin Pie Blizzard, yum. Haha looky there!! Haha I know pumpkin is indeed what I need! Thanks Brittney! This was a big hit. I’m a salted caramel junkie so it has to be done. This looks crazy delicious! Pinned. Thanks Julie! This was seriously good! I can’t wait to make it again! This looks outstanding – I’ve only ever done roll ups at Christmas and now I have an excuse to do one now! I can’t wait to give it a try – I’d love it if you’d come share this with the Awesome Life Friday link up. Coming from Gator Mommy Review’s Weekend Link Up. Nothing speaks to me more than pumpkin-anything. This looks amazing. Thank you for sharing and cannot wait to try it! Thanks for stopping Krystal I agree pumpkin anything is the way to go! And no, it’s never too early for gingerbread! Thanks Jenny, the salted caramel really made this for sure. I don’t know if I can go back to eating it plain! Thanks for sharing at Small Victories Sunday Linkup! Looks delicious!! Thank you so much Michele! I know salted caramel frosting right! Couldn’t pass it up, thanks for stopping by! Oh, yum. 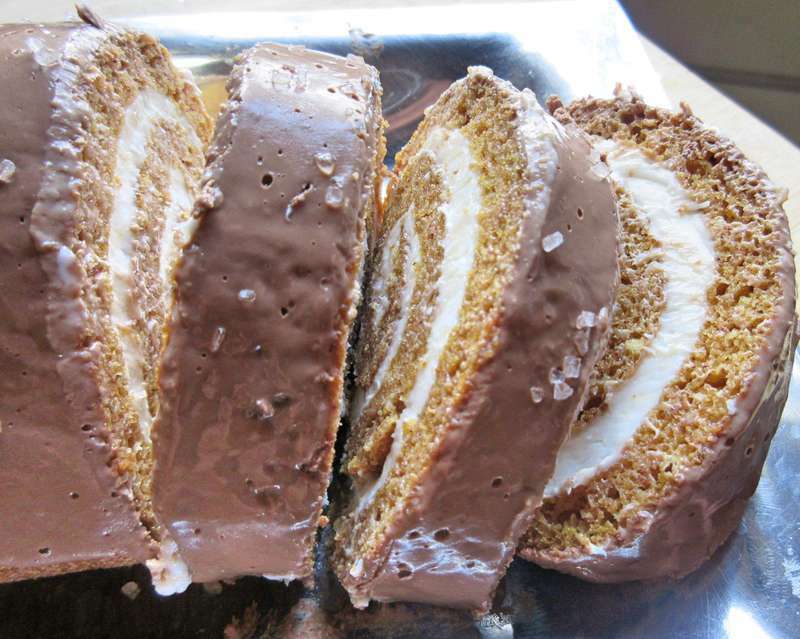 I don’t know why I’ve never tried a roll cake. Might have to sometime. They used to always look intimidating to me! I’m so happy I started making them, sooo good! Love this recipe! It’s perfect for fall! I can never turn down anything with salted caramel either! You and I are alike there! Salted caramel all the way, just bought some salted caramel tea today too! Thanks for stopping by Michelle! Thanks for stopping Lisa! This was a big hit! Holy moly! This sounds Ah-mazing! I would have never thought of this flavor combo but I will definitely save this for later 🙂 Thank you for sharing! Thanks Angeline! It’s a great combo for sure! Load me up! This looks absolutely wonderful! Visiting form Anything Goes Link Party! Thanks so much for stopping by Kin! Ooo I need to do this. Yum. Thabks for stopping Amber. Yum indeed, I need more of this. This looks absolutely fantastic! Mmmm salted caramel… I hope you and your gang are feeling better soon! Being sick is no fun. Nicely done, Alli. I only attempted a log roll once and, though it tasted good, it looked a mess. Yours is perfect! And I kind of wish I didn’t know about that frosting. Thanks for linking up at #SaucySaturdays. Haha Cristine I get so nervous when I have to roll it cut or fold and cakes so I’m thankful when things turn out for me. Sometimes the ugliest things taste the best, have had my fair share of those!! 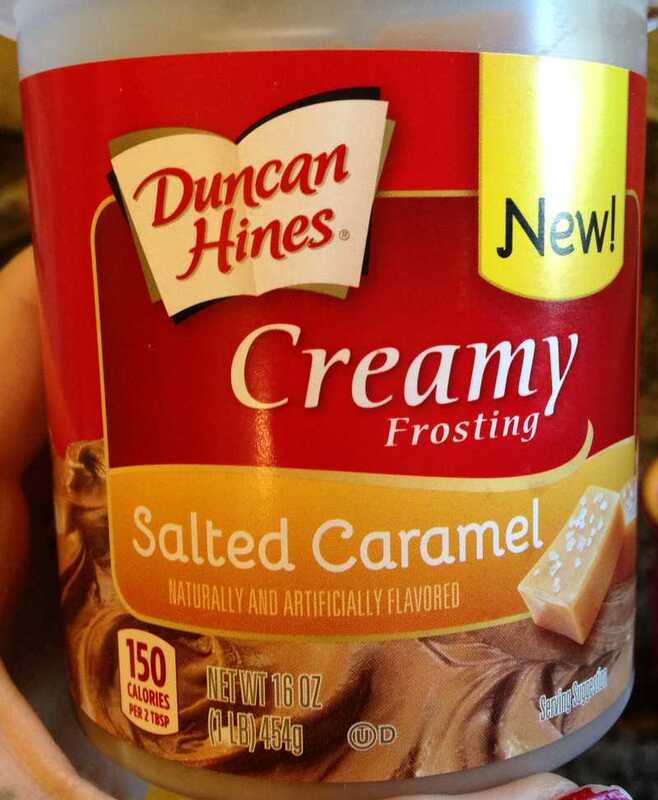 And this frosting omg yes I have to stock up while it’s still available. It’s not in the seasonal section so hopefully with salted caramel being a thing they will keep it around! Yum! My husband just made me a cup of coffee so I would love a slice thank you! Thanks for sharing with us at #AnythingGoes and have a great week. I’ve only recently started baking with pumpkin, but I can tell you now, I’d bake with it all year round! 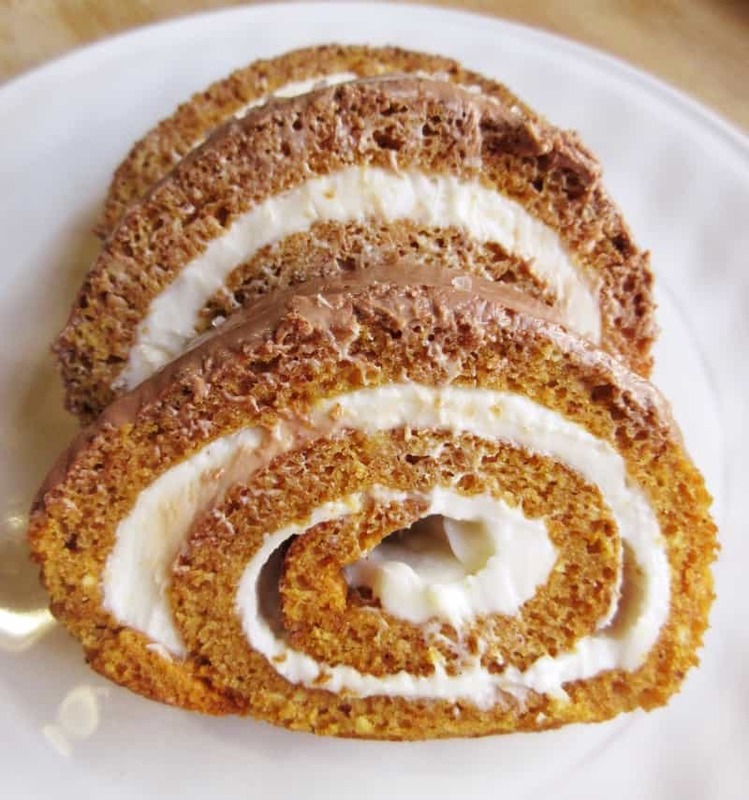 This cake roll looks so scrumptious! Oooh this looks so good! Thanks for posting. Hello from Motivation Monday. Oh this looks mouthwatering! I am all about salted caramel anything! Thank you for sharing on the Small Victories Sunday Linkup! You and me both! Thanks for stopping by Heather. Ahh, my mom has been using that ol’ frosting-as-a-glaze trick ever since I could remember! It always made frosting bundt cakes so much easier. 🙂 This little roll looks amazing!